Captain Mike Across America (Director: Michael Moore): Michael Moore’s latest film received a standing ovation at the Ryerson Theatre last Friday. Republicans will see his latest work as a propaganda film and some Canadians will call it a complete pile of rubbish. Democrats will love the film and see it as the truth that has been suppressed by the media. This Canadian found it very entertaining. During the last American election, Moore travelled the country encouraging younger people to vote and more importantly, to vote Democrat. His visits to colleges across America became known as the Slacker Uprising Tour. He takes the usual cheap shots at Bush, shows a number of Bush bloopers and invites musical guests to entertain the slackers (Eddie Vedder, Joan Baez, Steve Earle, REM and others). One of my favourite moments in the film comes when Moore holds a press conference. He points out that he had the courage to bring up the weapons of mass destruction lie, at the Oscars several years ago. He goes on to lambaste the reporters for being lazy and not doing their jobs — which is investigating the truth instead of being a propaganda machine for the White House. He argues that Americans should be able to sit at home, eat a bag of Tostitos and get the truth for free on the evening news. 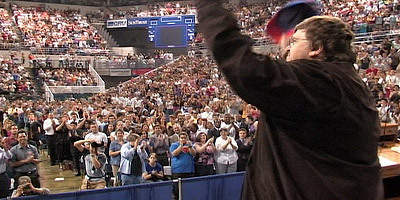 Instead, he argues that Americans had to shell out 10 dollars to get the truth in from his film Fahrenheit 9/11. As Moore went across the southwest in 2004, it was amazing to see how Republicans tried to shut him down. One businessman offered $100,000 to a student group to not invite Moore to their school to speak. Moore failed in helping to get Kerry elected but he succeeded in getting younger voters out to the polls in record numbers. For Democrats, Moore describes the film as “a cure for the hangover that followed” the 2004 election. When asked if Moore would do a follow up to the film he said “no”. Moore claims that his life was threatened a number of times. At one event a guy allegedly got up on stage and tried to attack Moore with a pipe. At another event, somebody pulled a knife and while in Fort Lauderdale a man tossed a cup of hot coffee on Moore. Love him or hate him, his films are entertaining. The audience at Ryerson couldn’t get enough of his stories. The film will have a limited theatrical release in North America according to Harvey Weinstein who was in the audience. Following that will be a DVD release which will include a lot of extra footage and a show Moore did in London shortly after 9/11. My guess is that all of this will come out next year just before the election (depending on how the Democrats are doing in the polls). This entry was posted in Documentaries, Film Festivals, TIFF and tagged Documentaries, politics, TIFF. Bookmark the permalink. I also particularly like the idea of recording the Q&As. For some people, that’ll be a rich resource. I hope we can meet up before the end of the festival. Maybe Ethiopian Friday or Saturday evening.